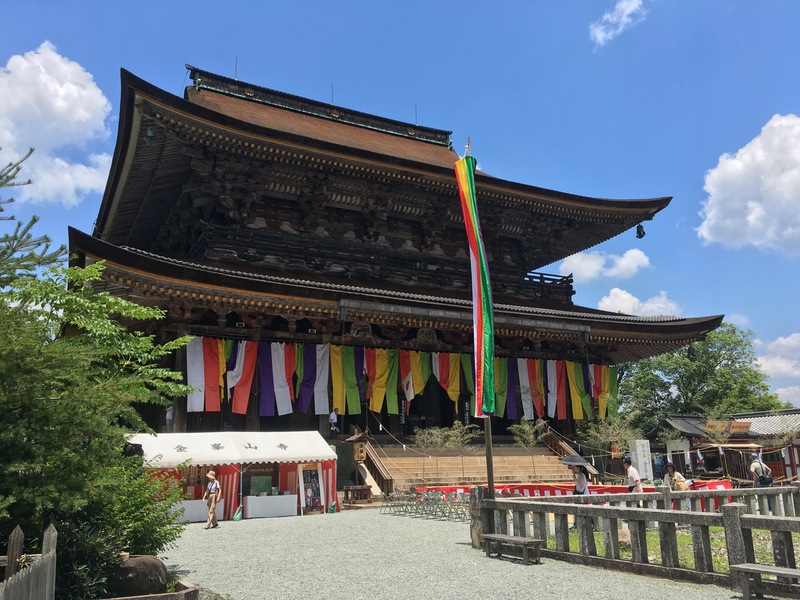 Zaodo,the main hall of Kinpusen-ji Temple, was decked out in banners of five colours as part of the Kaeru-tobi (aka Jumping Frog or frog hopping) festival celebrations. The five colours have many associations, including with the five elements. Yin and yang are important concepts in Shugendo so it is possible that the five colours are related to the five Chinese elements, as reported by Sekimori (2013) in Dharma World, a Buddhist magazine. Or are they colours related to the five elements of esoteric Buddhism, which Shugendo also draws on? That’s a question I am still exploring. The festival is a community event with two floats participating, both containing a frog. One involved children from the area near the temple pulling a float along on wheels. 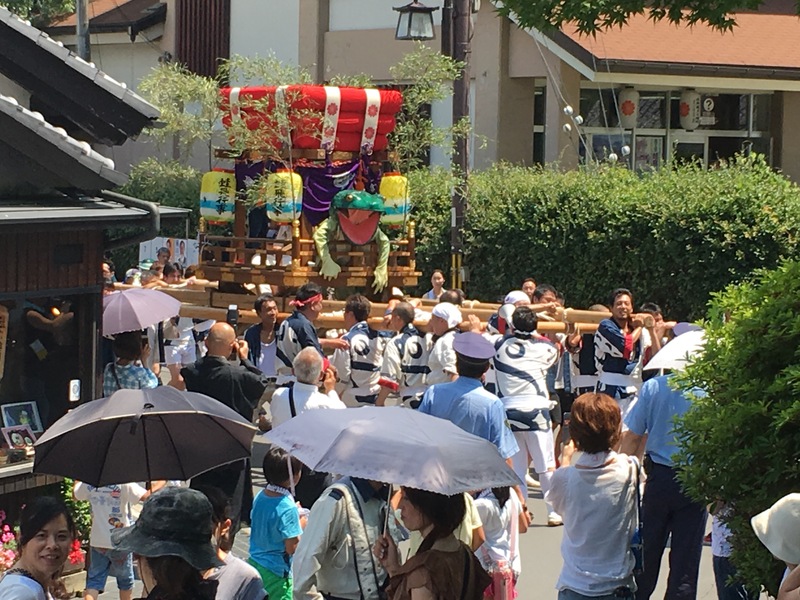 The other float, shown here, was carried past and then to the temple by a group of local men. It looked very heavy. As well as the floats, the streets leading up to the temple had frogs of all shapes and sizes hanging from bamboo branches. Most were hand-made out of paper, many in origami style. There were also lanterns with frogs on them. The streets would have looked charming at night. 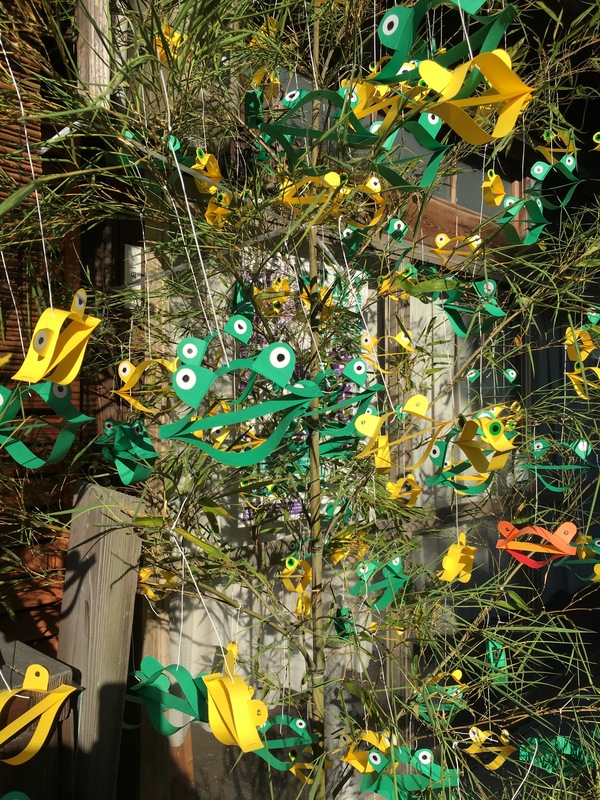 Here are some of the many paper frogs we saw. These ones were quite expressive, like the frog in the Shugendo ceremony. 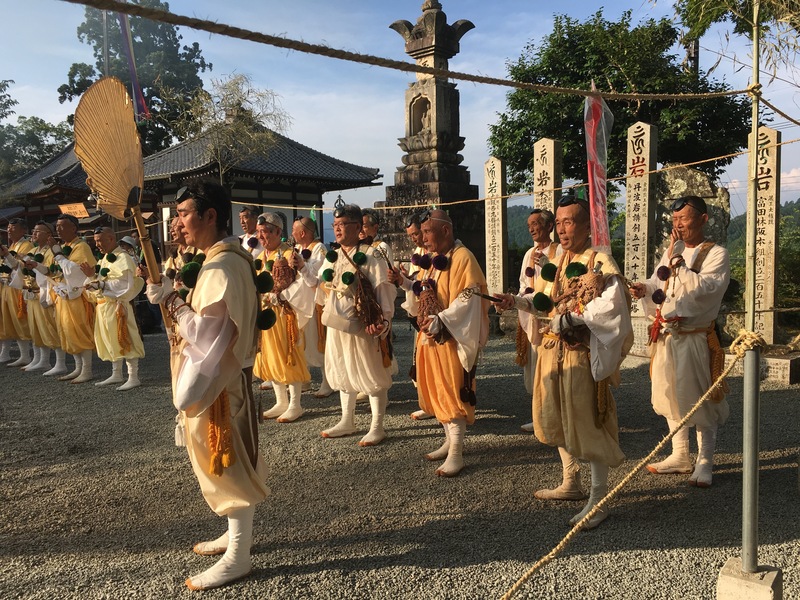 The Kaeru-tobi festival is based on a Buddhist fable where a man who had incurred the wroth of a local deity was saved by the Shugendo priests at Kinpusen-ji. They used their skills to change the man first into the shape of a frog and finally back to his original human shape once it was safe to do so. (Details of the fable are from the darumapilgrim blogspot). The Goma, a fire ritual unique to Shugendo, followed the transformation of the frog to his original human form. The five elemental colours were displayed on the rope delineating the sacred space (a square) around the fire. Similar to the Ise style shide, a paper streamer used in Shinto rituals, each side of the square had different colour, with the fifth colour around the fire stack itself. Arrows shot at the corner of each square also displayed the five colours. In this image the leader of the ceremony (santo-shi) is performing many hand gestures (mudras) in front of the fire. 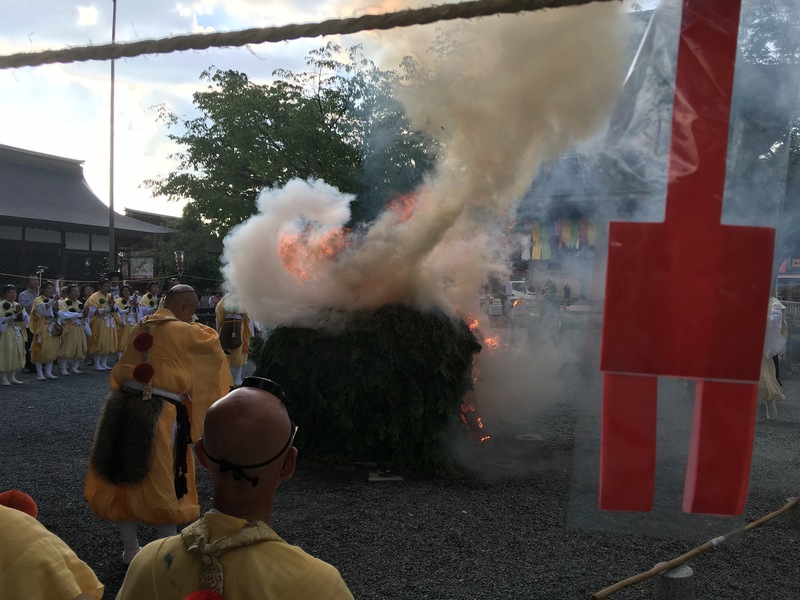 The fire ceremony is of great significance and importance in Shugendo, with the deep meaning inaccessible to the uninitiated. Here the saito-shi is tracing a letter symbolic of the Mahavairocana Buddha over the fire. Water is sprinkled periodically to prevent the fire from burning too quickly and to increase the purifying smoke. 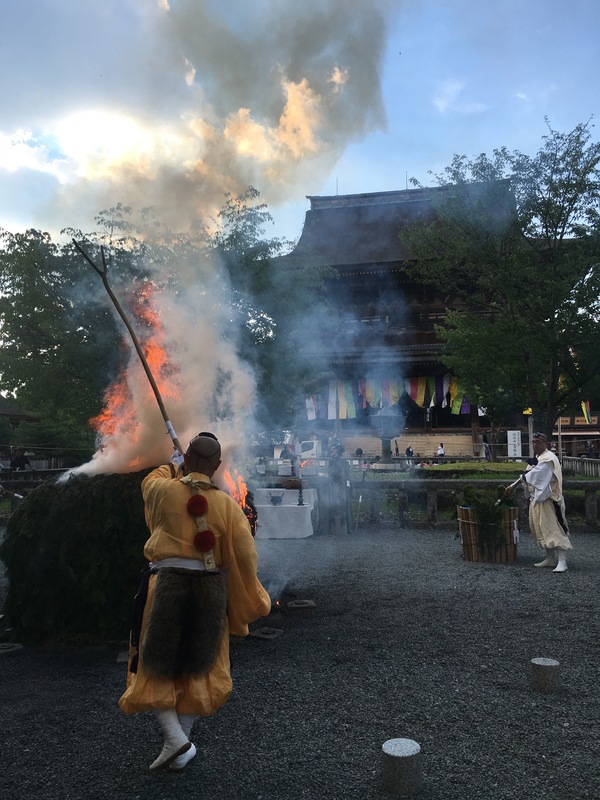 Further details of the fire ceremony can be found in an informative 1981 article on Shugendo and the Yoshino-Kumano pilgrimage written by Paul L. Swanson available here. During the fire ceremony shugenja either side of the fire chant and shake their shakujo, a short stick with metal rings. The sound is mesmerising. The large fan was used during the fire ceremony to direct the smoke. Shugendo view water as vital and the basic principle of all life. As well as the water sprinkled on the fire, the Noten-o-kami shrine in a secluded valley west of Kinpusen-ji Temple has a special water source said to promote good health. 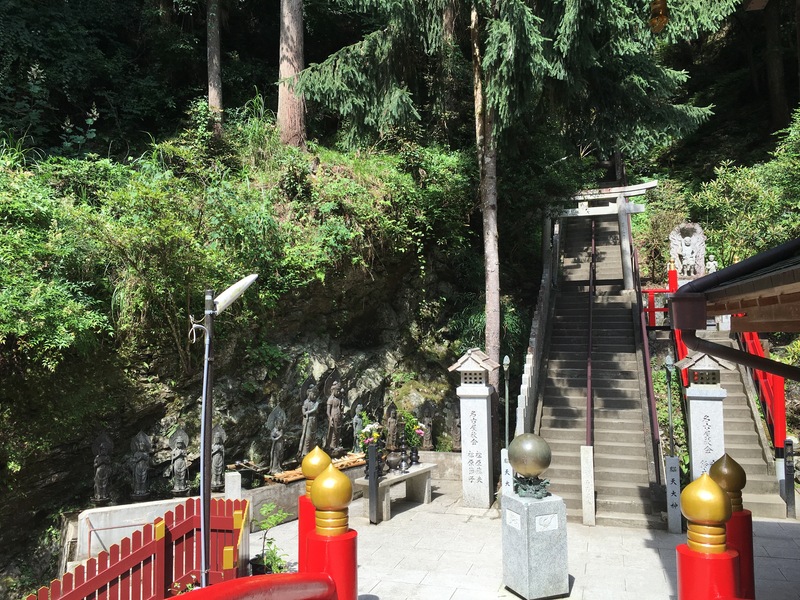 The temple and shrine are linked by hundreds of steps. 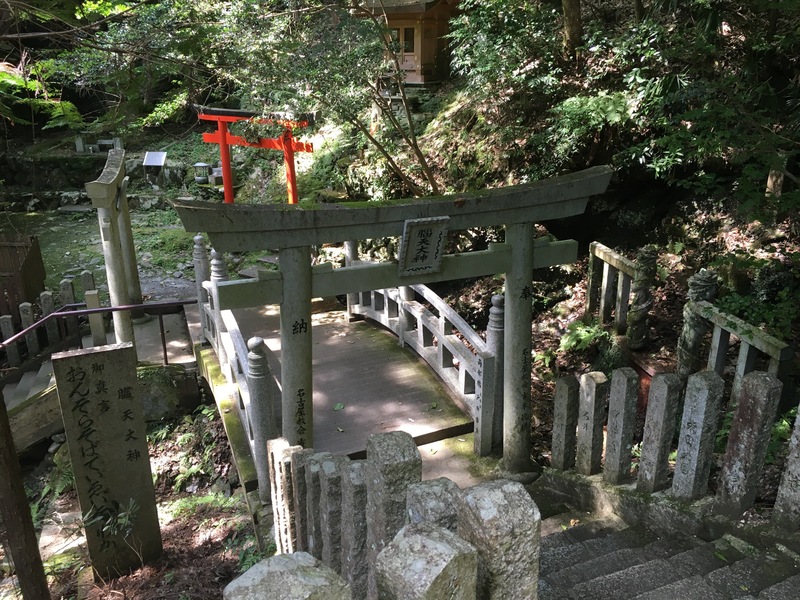 Many torii are found along the downhill path. The three in this image are next to a mountain stream that is flanked by two serpent-like sculptures, seen on the right. At the bottom of the steps one comes to a vermillion bridge that leads to the Noten-o-kami shrine. Ladels and water can be found near the statues on the left to perform the Shinto purification ritual before entering the shrine. I did not feel that it was appropriate to take photos in the shrine itself where water pours forth from the mouth of a serpent. Inside the shrine, the custom is to do clockwise prayer circuits dropping wooden sticks one by one into a wooden bowl (source: darumapilgrim blogspot). Given the strongly syncretic nature of Shugendo, the shrine could be part of the Kinpusen-ji Temple. Certainly the two are intimately connected and other shrines (Kitano Tenmangu and Inari) are found up the stairs closer to the temple. Once I discover their relationship I will update the post. Since early May 2016 I have been writing a complementary blog called elementaljapan.com. It tells the story of my research on the elements in Japan, initially during an 11 week stay between April and July 2016, with Kyoto as my base. After telling some of the Shugendo fire story in a post titled ‘Wood generates fire‘ my friend Naomi sent me the link to this video on Shugendo and the five natural elements. Shugendo loosely translates as ‘the path of training to achieve spiritual powers’. Practitioners undertake severe ascetic training in the mountains to reach enlightenment. Many rituals are involved, with chanting and music an integral part. Shugendo is a mystical religion based on a strong connection to nature and the elements, which this video aims to capture. The video is called ‘Kumano’, a region connected to Yoshino, and is captivating to watch. Participating in a winter pilgrimage in January 2018 deepened my understanding and appreciation of Shugendo and its connection to nature and the elements. I share my story in the post ‘Shugendo now – a winter pilgrimage on Mt Ontake‘. This entry was posted in Fire, Japan, Magic, The five elements, Water, Wood and tagged Buddhism, Energy, Fire, Fire and Water, Japan, Magic, Mudras, Shinto, Shugendo, Water, Wood. Bookmark the permalink. Thanks John. I imagine that you also felt like you were in another world. 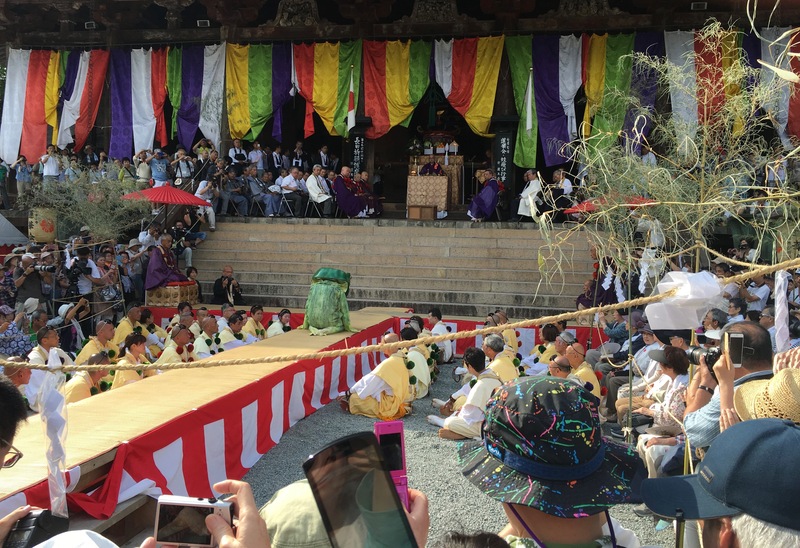 Experiencing the ceremony was perfect timing for my book on the elements in Japan. Shugendo will be featured in it for sure. Your pictorial report, enhanced with your detailed captions, means that those of us who haven’t yet witnessed this amazing ceremony are able to join in by proxy. I’m interested to know whether you were aware of the meaning of the story being enacted, before you attended. I imagine it would be a different experience either way, with one not necessarily being better than the other. That’s a good question. I was aware of the meaning behind the festival when I saw it. The reason I knew it was on was because I had visited the Temple the day before with Akiko Murakami, a knowledgable guide who I had been on a tour with earlier in my stay in Japan. When I discovered the festival was being held the next day I read more about it and decided to return. It was an opportunity too good to pass up. Even if you did not know the story much of it could be deduced from the way it was enacted. The frog was very expressive!